Television has had some great writers over the years, but none are quite like Aaron Sorkin. The New Yorker’s insatiable talent for penning interesting, intelligent and engaging screenplays is legendary and when you sit down to watch a show he has written; you know it’s going to be good. The final curtain fell last week on Sorkin’s TV career (for the time being) with the series finale of The Newsroom – and for a show that had a short run of three brief seasons, I think it encapsulates Sorkin’s talent in bringing out the best in stories and actors remarkably well. 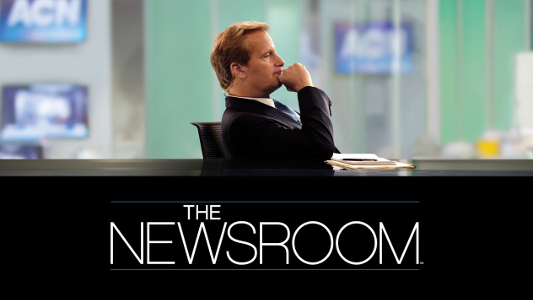 The Newsroom follows the story of a set of TV journalists and their production team in their efforts to produce a nightly news broadcast, News Night, that raises the bar of quality in an industry that has become disillusioned with its’ honourable traditions. Lead anchor Will McAvoy (Jeff Daniels) is the focus of the show in every sense, with the central theme of the show surrounding his ability to do the best he can despite personal dilemmas, including his relationship with ex-girlfriend: his new executive producer McKenzie McHale (Emily Mortimer) and his long-running battles with his ego. He is a great character, and one that is heavily relatable just as he wants to be. The show shines because of the interpersonal relationships between the great cast, with everyone playing a key role in making the situation believable and relatable. The love triangles and the heart-wrenching moments are there in spades to enjoy, even though they are excruciating at times. Sorkin’s masterful ability at writing great dialogue is matched by the cast, who put more drama into the story behind the news than you could ever think possible. Taking real inspiration from the will-they won’t-they relationship of Josh and Donna from The West Wing, The Newsroom features three such relationships that all blend together and produce some gripping emotional television as those involved battle against busy lives and massive events to win each other over. It might take away from the other events going on in the show at times, but for a show that looks at humanity first and the news second, I think it strikes a good balance. The Newsroom has a great progression through the three seasons that lets it change enough to stay new but keep the same feeling that makes it so enjoyable. The first season is all based around major real-life news events and the team’s challenges to cover them, while the second centres around a fictionalised news story that is above and beyond anything seen in modern reporting with the third season surrounding the minor unravelling of what News Night is about. The entire run of the show is symbolised by Will’s recount of Euripides’ theory of storytelling where “First act, get your leading character up a tree; second act, throw rocks at him; third act, get him down”. Well maybe the third part isn’t quite as apt, but the way in which the characters’ attempts at rationalising their actions comes full circle is a marvel of storytelling that always manages to pay off. While there are only twenty-five episodes, and a series that can be easily binge-watched in a matter of weeks, it really does pack the punch of a longer show. The typical criticisms of Sorkin’s writing are still at play in The Newsroom though. The first two seasons in particular come across as parochial, as Sorkin’s writing seeks to brow beat the audience into agreeing with his morally driven arguments about the way news should be broadcast and how people should feel about the rise of the Tea Party in American politics. Anyone who has watched The West Wing will also identify with Sorkin’s typically idealistic view of his characters – with a set of extremely likable individuals that have little to no personal troubles of their own to detract from that. While in my view The Newsroom does a better job of showing the darker sides of people, especially with the storyline of Operation Genoa in season 2 and the long-running difficulties of Will, it still does seem at times like you are being lectured to rather than entertained. Although in saying that if university lectures were half as exciting and engaging as an hour of Aaron Sorkin drama I think attendances would be far higher. Another problem the show has to an extent is a certain lack of spontaneous and dramatic events. Of course there are a few, but the problem with basing a show’s chronology around major news events or, even when they are fictional (in season 2), doing so via a pseudo-flashback is that the audience can see things coming. Nothing really jumps right out of the blue. The problem is offset of course by the great dramatic styling that happens when there is a major plot point, with the classic use of a song towards the end of the episode to frame what’s going on on screen being well used. While it is a definite shame that The Newsroom‘s run was limited to just three seasons, the final one of which was only a half-season and the other two being of HBO’s typical ten show run, I think Sorkin managed to call time on the show whilst it was on an uptick. Throughout the series, storylines never felt dragged out or redone. Sorkin’s clever use of foreshadowing and looping storylines holds seasons and the series together fantastically well, and some aces are kept up the sleeve until the series finale – which manages to round off the show beautifully by taking the viewer back to how the set up for season 1 was put into play. In hindsight the drama might not have been quite as amplified as it is in other shows, but while I watched through it that criticism didn’t cross my mind. If this is the end of Aaron Sorkin’s TV career, he has gone out on a high. The Newsroom is a great show that tells a compelling story whilst giving a fresh perspective on journalism, an element of modern culture that is often seen through only a dark lens. If you like good TV that makes you think and entertains you at the same time, then it’s time to go back and watch The Newsroom.